Click here for a downloadable PDF of CATS’ rules. CATS Board also has created a “crib sheet” — a short summary of CATS’ rules of play that everyone needs to know before playing in CATS. Members are urged to familiarize themselves with the rules, and to print out or download the crib sheet below and have it with them on the court for reference during play. Or, use your phone to check the rules or crib sheet while on the court. Unless otherwise specified, CATS play is governed by USTA rules. WARM UP: Starts on the hour and ends 15 minutes after. All players will warm up at this time. All 4 starting players may take a maximum of 6 practice serves simultaneously at 15 minutes after the hour. In the B and C level, if both captains agree, they can alternately play first ball in instead of 6 practice serves. ROTATIONS: Racquet spin will be done at ten minutes after the hour. The winner of the spin decides to receive or to serve. The other team may select the side of their choice. The serving team must select their two starting players first for the first and second rotations. Player rotations are at 4 games (8 games Open only). SERVICE ORDER: When using a 4 or 8 game rotation a team can change the order of service or court position as long as the change is made at the start of each rotation. PENALTIES AND FORFEITS: These are incurred as follows: If, at 15 minutes after the starting hour a team has only one player, that team forfeits and 10 games may be presumed to have been played with all ten games credited to the other team. If both teams field only one player apiece at 15 minutes after the starting hour, both teams are assessed a loss and 10 games are added to the “Games Played” category for statistical purposes. A team of two players may not be assessed a penalty until it is time for the first player rotation. All additional penalties for two and three players are predetermined by the individual Division Captains and recorded by the Division Coordinator and League Coordinator. INJURED PLAYERS: Any injury incurred by a player during a match or warm up, which causes unavailability for further play, will cause no penalty if two players on the team remain. An injured player will be permitted to return after 1 complete rotation. If only one player remains the injured player’s team must forfeit. Additional games will be credited to the winning team. One game will be assessed for every 10 minutes remaining to be played in the match to a maximum of 10 games. Preexisting injury or illness will not be considered as occurring during the match. If a player leaves before 10:45 P.M. for any reason other than an injury occurring during play, pro-rata penalty games will be awarded to the opposing team as determined by the division coordinator. SCORING: Score using the “No-Ad(vantage)” system in which the first team to get four points wins the game. At deuce in a game, the receiving team calls who shall receive. If during a rotation, it is noted that a sequence has been altered, the player who is then serving will relinquish service to the appropriate player and the game continues at whatever the score is at that time. If that game has been completed when the error is noted, the order of service remains altered from then on. If a change in receiver rotation is discovered during a game, the rotation resumes the next time that team receives service. Receiver and server rotations are changeable as teams rotate players. The decision as to whether a serve is good is solely that of the receiving team, except for let serves. Deuce points will be played gender to gender to conform with USTA mixed couples rules. If server is female, she will serve to the female opponent and males will serve to male opponents. If there is no same gender receiver, the receiving team chooses who will receive. If a ball from another court enters the playing area while a point is under way either team may call a “let” and the point is restarted at first serve. This must be called immediately, otherwise the point stands. A ball in play may not be stopped by hitting it down or catching it when it appears to be going out-of-bounds. Doing so gives the point to the other team. Only the receiving team may call a ball out. When a team is not certain whether a ball landed in or out, it is to be considered good. The point is not played over. Neither foot of the server may touch the boundary line or step into the court until after the racquet makes contact with the ball. The receiving team has the right to call a foot fault to the attention of the server but cannot assess a penalty. WINS, TIES, AND TIE-BREAKING: A Team may win a match either by one regular game or by a tie-breaker. 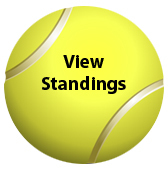 Play must continue until 11:00 PM, unless a tiebreaker is being played or completed. If the teams are tied at or after 10:55 PM (including penalty games); a tiebreaker must be played. Effective April 25, 2018: Follow normal rotation unless there is a tie-breaker, then each captain may choose which players to play in the tie-breaker. Service rotation is not altered. A 12-point tiebreaker will be played; the first team to seven points by a margin of two points wins. The next player due up in the serving rotation will start the tiebreaker serving only once in the deuce court. The normal service order is the followed with all subsequent servers having two serves starting in the ad court. If you must give up your court to players, find a vacant court and complete the tiebreaker. COURT: Court fees for each team player are due by their first scheduled match each session. MEMBERSHIP: Full time players having not paid their membership dues for the upcoming year by the second playing night may be dropped from their team for that session. Social members having not paid their dues will lose their playing and social status both as a sub and at all social events. They also will not be reinstated until dues and penalties are paid. REBATES: Rebates are subject to the discretion of the CATS Board. CATS has 3 sessions with either 3 or 4 playing levels. Teams in each playing level are comprised of 6 players, with 5 or 7 players also possible. Gender make up by team is flexible. Prior to each draft a general ranking of players is recommended. Players MAY NOT be chosen on the first round by the same Captain. Swapping of players can take place at any time during the evening of the draft. Replacing a drafted player with another eligible player can also take place the night of the draft. Full time players can play a maximum of 13 matches in the Fall and Winter sessions and 8 matches during the Summer session. All full time players should be scheduled equally. Half-time players can play a maximum of 6 matches during the Fall and Winter sessions and 4 matches during the Summer session. Subs paying “Social Membership Rates” cannot be a sub more that three times per session. A social member can upgrade their playing status to 13 times per session, the same as a regular playing member, by paying full membership fee at any time during the fiscal year. Two weeks after the Division’s draft, each Captain must turn over to the Division coordinator his players schedule. Players on one team may not substitute on another team in their division for any regular match. However, any player may sub on a higher division team. Prior approval needed by division coordinator in consultation with league coordinator regarding subbing in a lower division. It is recommended that a sub be selected from the team members not scheduled for that match or from the division’s suggested sub list. Team Captains will be provided with updated sub lists by Division Coordinators. The use of a sub that does not belong to CATS will result in default of the match. The same applies to the use of a team player who has not paid their dues at the specified time. Winning Captains, or their designates, are to make certain that match results are recorded on the master score sheet each week. Captains will remain alert to responsibilities regarding score sheets and balls whenever the League Coordinator is not present. Names of all players should be listed on the envelope. Sub players should indicate who they are playing for. CONFLICTS: In keeping with the social nature of CATS play, all conflicts are to be resolved in a reasonable fashion. Disputes that can not be resolved in a gracious manner on court are to be resolved by the Division Coordinator, with appeal to the League Coordinator available. UNSPORTSMANLIKE CONDUCT: If a team feels, through word or deed, an Unsportsmanlike Act has been committed during play, the Captain representing that team may file a formal written complaint with the Division Coordinator. If the complaint is against the Coordinator’s team, it may then be filed with the League Coordinator. Appeals can be made to the League Coordinator and then to the President. If a decision is rendered in favor of the complainant, penalties assessed may consist of suspension of a player or in the case of a team, loss of a game or a match. All divisions: If only 2 players are present, 4 penalty games are assessed. A player who arrives late to match play resulting in penalty points against his team will be allowed to begin to play the next official rotation, even though the penalty remains. B and C Divisions: If 3 players are present without a woman player, 4 penalty games are assessed. A Division: If 2 men are present without a woman player, 6 penalty games are assessed. Open Division: If 2 men are present without a woman player, 7 penalty games are assessed on the first occurrence for a given team. If 2 men are present without a woman player, 14 penalty games are assessed on the second occurrence for the same team per session. If 2 men are present without a woman player, 21 penalty games are assessed on the 3rd occurrence for the same team per session. This is a short summary of the rules and practices that everyone needs to know before playing in CATS. Never walk between courts or onto your court before the 9:00 PM bell rings. If you must walk between courts after 9:00 PM, wait until play on those courts stops and then quickly get through. Captains, make sure you have 3 players. At 9:15 PM, if a team has only 1 player, that team forfeits and the winner’s score is 10-0. If there are only 2 players on one team, see Penalties below. No penalties are assessed if the third player is present before the start of the second round. At 10 minutes into the warm-up, spin to determine who serves and who receives. Server fields team first. Warm up until 9:15 PM. Then the four starting players take their positions and practice their serves. Each player may take six (max) practice serves. In B or C, IF BOTH CAPTAINS AGREE, “First Ball In” (FBI) may be elected instead of practice but all players must do FBI, if elected by the captains. For the second round, the third players in may warm up briefly including serves (unless FBI was elected). Then there is no more warm-up. Play continues until 11:00 PM. If, at or after 10:55 PM, the score is tied (including any penalty points) a 12 point tie-break must be played. First team to 7 points (by a 2 point spread) wins. If the court must be surrendered at 11:00, the tie-break must be moved to a free court. The score is recorded on the master list. List the names of the players on the envelopes. Collect subs’ fees and indicate for whom they played on the envelope. Sub fees are $15 ($15.50 in Open) for Fall and Winter and $12 in Summer. Guests/visitors (one per team max) maintain a quiet, neutral, inactive role so as to not be distracting and sit on their Team’s end of the bench. They should not advantage or disadvantage a team by be overly supportive of one team over another by their words or actions. They should not keep score or assist in money collection. They should not retrieve balls or call lines. If a captain deems their behavior to be distracting or unsportsmanlike, any captain or acting captain may ask them to leave the court.